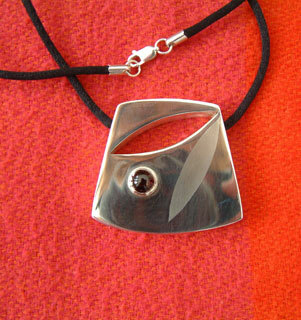 This hollow necklet is formed from sheet silver and set with a deep claret coloured tourmaline stone. The frosted leaf design contrasts with the polished surface and echoes the shape through which a coloured dress fabric will be seen. The pendant hangs on a nylon cord necklet that is fixed where it enters the silver form and fastens with a silver lobster clasp.